Ivan Sergeyevich Turgenev (Russian: Ива́н Серге́евич Турге́нев) (November 9, 1818 – September 3, 1883) was a Russian realistic novelist, poet, and playwright. A social reformer, Turgenev occupied an uneasy position between old-guard Tsarist rule and increasingly fashionable political radicalism. Turgenev's novels were less ambitious than the vast canvasses of his great contemporaries Fyodor Dostoevsky and Leo Tolstoy. Also unlike these writers, Turgenev was less nationalistic or preoccupied by Russia's religious identity. 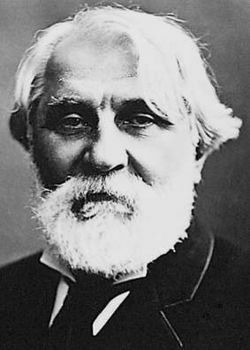 Born into a wealthy family with an estate of 5,000 serfs and educated in St. Petersburg and Germany, Turgenev eventually settled in Paris, where he became friends with the French novelist Gustave Flaubert. He shared the French writer's largely pessimistic political sentiments as well as Flaubert's rigorous aesthetic principles. Called by Henry James a "novelist's novelist," Turgenev authored spare, carefully crafted works, Russian in subject matter but informed by attachments to Western political and social trends. Turgenev's early short-story collection, A Sportsman's Sketches (1852), presented an affectionate, liberal-minded picture of the peasantry, helped educate the intelligensia about the plight of Russian serfs, and is thought to have contributed to their eventual emancipation by Alexander II in 1861. Turgenev's best-known novel, Fathers and Sons (1862), is among the most important works of nineteenth century fiction. Set during the period of social unrest following Russia's defeat in the Crimean War, the central character, Bazarov, became the archetype of the nineteenth century nihilist (a word first popularized by Turgenev) and has been described as the "first Bolshevik" in Russian literature. The character type was more fully realized in the works of Dostoyevsky and Joseph Conrad, as well as later existential fiction. Significantly, Turgenev portrayed the ineffectiveness of the older generation of liberal reformers as the background for the rise of radicals for whom institutions of authority were beyond reform. The rise of political radicalism and violence, culminating in the Russian Revolution, was anticipated in this early work. Turgenev was born on November 9, 1818, into an old and wealthy family who owned a large estate in Orel, Russia. His father, Sergei Nikolaevich Turgenev, a colonel of a cavalry regiment, died when he was sixteen, leaving Turgenev and his brother Nicholas to be brought up under the care of their abusive mother, Varvara Petrovna Lutovinova, who owned large estates and many serfs. After the normal schooling for a child of a gentleman's family, Turgenev studied for a year at the University of Moscow, then the University of St. Petersburg focusing on the classics, Russian literature, and philology. He was finally sent, in 1838, to the University of Berlin. There, his studies focused sharply on the philosophy of Hegel and history. Turgenev was impressed with the more modern society he witnessed in Western Europe, returning home a committed "Westernizer." He believed that Russia could improve itself by imitating the West and abolishing outdated institutions such as serfdom. Turgenev's early attempts in literature, poems, and sketches had indications of genius and were favorably spoken of by Belinsky, then the leading Russian critic. During the latter part of his life, Turgenev did not reside much in Russia; he lived either at Baden-Baden or Paris, often in proximity to the family of the celebrated singer Pauline Viardot, for whom the author harbored an ardent, life-long admiration. His advances were rebuffed, but Turgenev became a family friend. Turgenev never married, although he had a daughter with one of his family's serfs. Tall and broad, Turgenev's personality was timid, restrained, and soft-spoken. His closest literary friend was Gustave Flaubert. Turgenev occasionally visited England, and in 1879, the degree of D.C.L. was conferred upon him by the University of Oxford. He died at Bougival, near Paris, on September 4, 1883. Turgenev made his name with A Sportsman's Sketches (Записки охотника), also known as Sketches From a Hunter's Album or Notes of a Hunter. Based on the author's own observations while sport hunting birds and hares in his mother's estate of Spasskoye, the work appeared in a collected form in 1852. As a writer, Turgenev excelled at description, especially landscape. He did not care for the complex psychological portraits of Russia's other great nineteenth century novelists, Leo Tolstoy and Fyodor Dostoevsky. His talent did not lie in that direction, but in his ability to evoke a mood and paint a verbal portrait of the Russian countryside. His style of writing was unique. He kept a notebook of descriptions that he would fit into appropriate places in his novels. He did not really consider himself a novelist, and his novels were quite slender in comparison to most nineteenth century Russian novels. He wrote many short stories as well. His novels, like his short stories, were based on rather simple plots, closer to drama than most novels, with fewer characters and subplots. In 1852, after publication of his sketches, he wrote a now notorious obituary to his idol Nikolai Gogol in the St. Petersburg Gazette. The key passage reads: “Gogol is dead!…what Russian heart is not shaken by those three words? …He is gone, that man whom we now have the right, the bitter right given to us by death, to call great.” For reasons known only to the censors, its publication was banned and the young writer landed in prison for a month. Afterwards, he was forced into exile at his estate for nearly two years. His novel, Rudin, was important not for its artistic merit, but because it told the story of the so-called men of the 1840s, the generation of Russian liberals that opposed the authoritarian regime of the arch conservative Tsar Nicholas I but were generally weak and ineffective in their opposition. This spawned a type of character that would be popularized in certain nineteenth century Russian novels, the "superfluous man." This character is idealistic but unable to effect any positive changes. Rudin is a good example. He is no longer young, but at 35, he still hangs on to his ideals yet is unable to act on them. What might have seemed noble for a student appears slightly ridiculous in a middle-aged man. When Natasha, a young woman, is inspired by his dreams and offers to elope with him, he is unable to muster the courage of his convictions in order to act, preferring to remain alone with his ideals. His next work was A Nest of Nobles (Дворянское гнездо) in 1859, and was followed the next year by On the Eve (Накануне), a tale which contains another of his beautiful female characters, Helen. On the whole, Turgenev's female characters are more noble and resolute than the males. On the Eve (of reform) portrayed the Bulgarian revolutionary Dmitri, continuing Turgenev's interest in social and political topics that made him quite popular in his day. In 1862, his best and most successful novel, Fathers and Sons (Отцы и дети), was published. The novel takes up the social themes of the day, but as the title suggests, it is structured around a generational gap between two brothers, both "men of the 40s" and two representatives of the new radical intelligentsia, or "men of the 60s." Arkady Kirsanov is the son of a well-to-do landowner who invites his friend Bazarov to stay the summer with him at his family estate. This sets up a series of encounters with Arkady's father and especially his uncle, Pavel. Bazarov is a nihilist whose ideas elicit a heated response from Pavel. For the most part, Bazarov is more intelligent and gets the best of Pavel, leading to heated exchanges. When Pavel suspects Bazarov of trying to seduce his brother's mistress and challenges him to a duel, he is slightly wounded, but his ego takes a more grievous hit. However, while Bazarov easily bests Pavel, professing no belief other than science while dismissing liberal culture, he nonetheless falls in love with Madame Odintsova. She rejects him and, heartbroken, he lets himself go. Failing to dress a wound inflicted while dissecting a corpse, his wound becomes infected and he dies. Bazarov is heralded by many as one of the finest characters of the nineteenth century novel, but he was not accepted by the younger generation, who thought that Turgenev was mocking them. Turgenev's more conservative readers did not appreciate his treatment of Pavel. They saw in him a caricature of their romantic idealism. The stinging criticism, especially from younger radicals, disappointed Turgenev and he wrote very little in the years following Fathers and Sons. Turgenev's later novels, with their antiquated language and stilted situations, are considered inferior to his earlier efforts. Smoke (Дым) was published in 1867, and his last work of any length, Virgin Soil (Новь), was published in 1877. Aside from his longer stories, many shorter ones were produced, some of great beauty and full of subtle psychological analysis, such as Torrents of Spring (Вешние воды), First Love, Asya, and others. These were later collected into three volumes. His last works were Poems in Prose and Clara Milich, which appeared in the European Messenger. Turgenev is considered one of the great Victorian novelists, ranked with Thackeray, Hawthorne, and Henry James. A melancholy tone pervades his writings, conveying a tone of lost ideals and weakness. This page was last modified on 10 March 2018, at 23:05.